I was born in Paris, TX and raised in the small town of Blossom, TX. I was raised in an artistic family although it wasn't conventional art. My family's art consisted of quilting, embroidery, crochet and woodworking. In our small school art was not offered although I was introduced to colored pencil through drawings in High School Biology class. After graduating, getting married and having a family I developed an interest in plien air panting which lead to taking oil painting classes from a local artist. 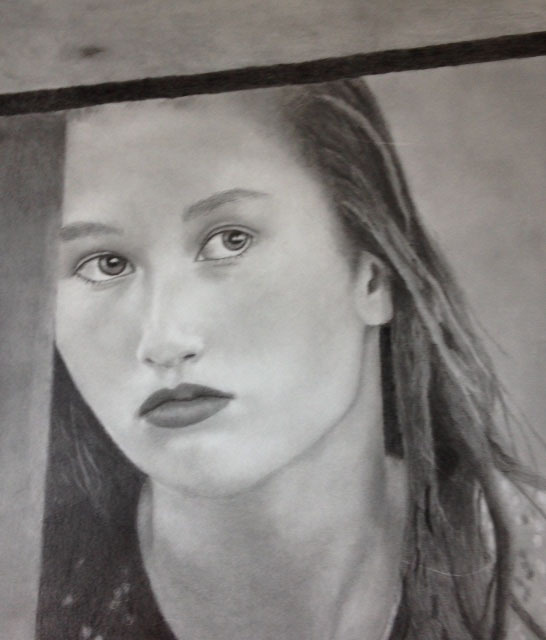 Through the years I have taken drawing classes and oil painting classes. I worked in oils for many years. When I was thirty I was diagnosed with a neurological disorder Essential Tremor by that time it was begining to be difficult to manage painting because I liked working in a realistic style. Only by the grace of God am I able to do anything artistic. In the meantime I moved to Tyler, TX and met my now husband. My husband Glenn and our Jack Russell, Jackson now live in Flint TX. We moved several times but I always found a way to keep a drawing journal nearby and would take an art class occasionally just because I enjoyed art. I took a drawing class at Tyler Junior College because I had figured out that by using a pencil I could draw in the realistic style even with my tremor. The teacher, Maureen Killaby, taught us how to best use our tools and how to work with a large format. I was having some problems with the my pencils so my teacher helped my by introducing me to a heavier mechanical pencil. I soon wanted to do some work in color so I started researching colored pencils. I wanted good light fast pencils, creamy and easy to handle so I started researching plus joined the Colored Pencil Society of America. I also subscribe to two colored pencil magazines. For my first colored pencil portrait I used Ann Kullberg's portrait book for instructions. I'm not satisfied doing the same thing all the time so I like trying different subjects, papers, and pencils just to "get out of my box" and not get in the rut of doing the same thing. Elizabeth Guthrie www.HeavenlyBlueFineArt.com Attachments area Click here to Reply or Forward 0.84 GB (5%) of 15 GB used Manage Terms - Privacy Last account activity: 3 minutes ago Details I was born in Paris, TX and raised in the small town of Blossom, TX. I was raised in an artistic family although it wasn't conventional art. My family's art consisted of quilting, embroidery, crochet and woodworking. In our small school art was not offered although I was introduced to colored pencil through drawings in High School Biology class. After graduating, getting married and having a family I developed an interest in plien air panting which lead to taking oil painting classes from a local artist. 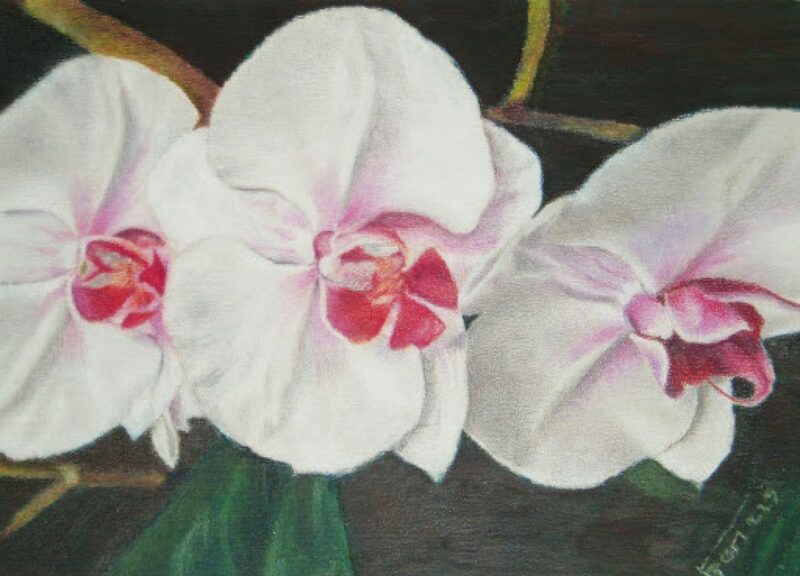 Through the years I have taken drawing classes and oil painting classes. I worked in oils for many years. When I was thirty I was diagnosed with a neurological disorder Essential Tremor by that time it was begining to be difficult to manage painting because I liked working in a realistic style. Only by the grace of God am I able to do anything artistic. In the meantime I moved to Tyler, TX and met my now husband. My husband Glenn and our Jack Russell, Jackson now live in Flint TX. We moved several times but I always found a way to keep a drawing journal nearby and would take an art class occasionally just because I enjoyed art. I took a drawing class at Tyler Junior College because I had figured out that by using a pencil I could draw in the realistic style even with my tremor. The teacher, Maureen Killaby, taught us how to best use our tools and how to work with a large format. I was having some problems with the my pencils so my teacher helped my by introducing me to a heavier mechanical pencil. I soon wanted to do some work in color so I started researching colored pencils. I wanted good light fast pencils, creamy and easy to handle so I started researching plus joined the Colored Pencil Society of America and joined the local Texas CPSA DC 224. I also subscribe to two colored pencil magazines. For my first colored pencil portrait I used Ann Kullberg's portrait book for instructions. I'm not satisfied doing the same thing all the time so I like trying different subjects, papers, and pencils just to "get out of my box" and not get in the rut of doing the same thing. About 7 years ago I started this blog “Heavenly Blue Fine Art” because I felt lead to name it this but soon learned I wasn’t technology savvy. That’s when I started a blog using just my name. During this time I learned how to do just enough to get by with a blog. Of course I never made money or much progress with getting my artwork out to the public (with the exception of scammers). Recently I have been blessed with taking an online course by Matt Tommey. He has 4 books out that teaches you how to have a heart for God, and how to listen to the Holy Spirit. How to do what the Holy Spirit asks you to do as an artist plus Matt teaches you how to “Build Your Brand” in the business world. I’m coming clean with this information because I am no longer trying to get my artwork and business going on my own. I firmly believe that God is in control of my life, my artwork and besides He is the greatest creator of all time, right! I let myself be led by others to believe the lie that because I have Essential Tremor and have to use a light box to get my pictures on the paper that it’s really not “original artwork”! I’ll no longer believe that lie because no one knows how much effort and time goes into each piece of my work! There are many other lies that I have believed that held me from moving forward in my artwork but that’s behind me now. God’s word says that all things are possible through Jesus Christ. I do hope you will follow along as I move forward. I still am not technically educated but I too will continue to grow and learn. Please feel free to leave constructive comments on my pages. Ann in a very giving person! She is one artist that “Passes it forward” giving the new artists an opportunity to further their career. I have been honored to be in two of her COLOR Magazine for COLORED PENCIL and two of her CP TREASURES and two of her CP HIDDEN TREASURES! SO I WANT TO GIVE A SHOUT OUT TO ANN! This is a beautiful young lady that is growing up fast, they all do that never stay small for very long. That is God’s plan to be born, loved, trained, and grow up hopefully with the moral principals taught to her by her loving family. I am personally proud of this young lady because her grandmother, my dear friend, has shared her grandchildren with me ever since the youngest boy, Tanner was born. We all have complex moments in our lives but I believe this young lady will make her family proud. This an 18 x 18 graphite, graphite powder, drawing on Strathmore Bristol Smooth paper. Permission granted by ZAP Photography. I hope each enjoy and relate to this beautiful young lady. Have a blessed day. This is a door knocker from a picture taken in Greece by nephew, Brandon Burns, and I was given permission to paint my interpretation. It is 14 x 18 on Fabriano HP 300 paper, using watercolor pencils in a wash, then using Polychromo pencils for the door knocker. I do hope you consider the title as much as the work itself. Have a blessed day. This is a home place of a dear friend. I am sure there are many memories from here. 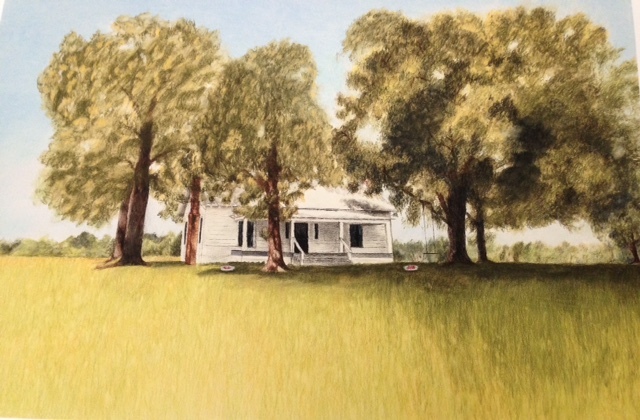 It is 20 x 30 on Fabriano HP 300. watercolor pencils and colored pencil. Photo reference was provided by client. I hope you enjoy going back memory lane with this. Have a blessed day. It is that time of the year that all the trees are turning all sorts of beautiful colors. 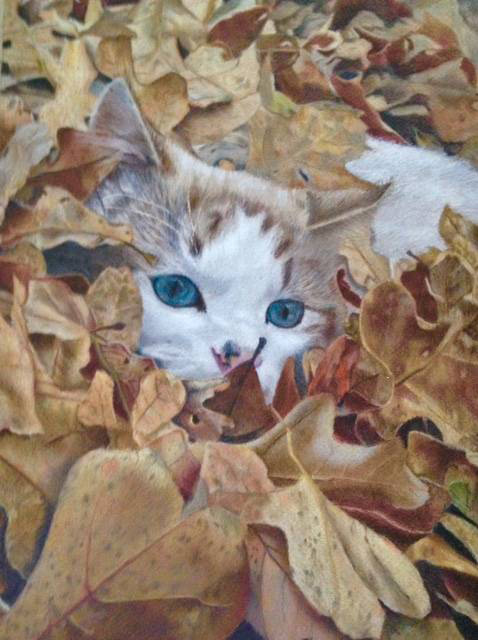 With permission from my daughter Tisha Clinkenbeard I painted a picture of their cat Blue Eyes playing in a pile of fall leaves. This is 16 x 20 on Tan Mitenes board with colored pencil. I do so hope you enjoy the beauty in the simple things that God has given us to enjoy. To all have a blessed day. This is the last of a series of paintings I did of friends and myself while we vacationed in Martha’s Vineyard together. For five years we would gather to spend a week at “the cabin” that was in the family of one of the ladies. We came from Florida, North Carolina, California, and Texas so it was quite a combination! We had lots of fun, solved the worlds problems, and watched the World Trade Centers come crashing down on a black and white TV which changed everyone’s world in the United States of America forever. 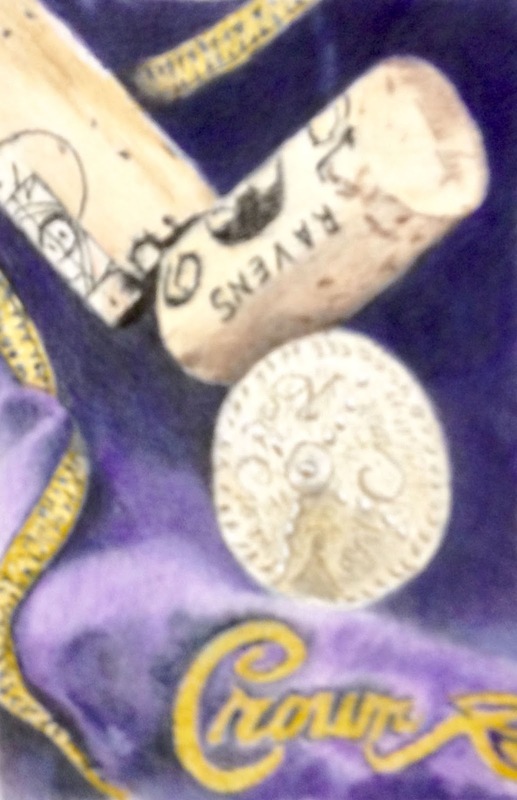 This is 5″ x 7″ on Stonehenge paper, Polychromo, Pablo pencils. My reference. All images © of Elizabeth Francis Guthrie. Unauthorized use and/or duplication of the images or material on this blog without written, express permission from Elizabeth Francis Guthrie are strictly prohibited. Links may be used provided that credit is given to Elizabeth Francis Guthrie and to EFrancisGuthrie.com with a link to the original content. All of the proceeds will be donated to Shriner’s Children Hospital. I was born in Paris, Texas and raised in the small town of Blossom, Texas. I was raised in an artistic family although is wasn’t conventional art. My family’s art consisted of quilting, embroidery, crafts, crochet and woodworking. In our small school art was not offered although I was introduced to colored pencil through drawing in high school in a Biology class. When I was thirty years old I was diagnosed with a neurological disorder called Essential Tremor. By that time it beginning to be difficult painting because I liked working in a realistic style. Only by the grace of God am I able to do anything artistic. In the meantime I moved to Tyler, Texas where I met my husband. My husband Glenn and I, along with our Jack Russell Terrier, Jackson now live in Flint, Texas. We moved several times but I always found a way to keep a drawing journal nearby and would take an art class occasionally just because I enjoyed art. I took a drawing class at Tyler Junior College because I had figured out that by using a pencil I could draw in the realistic style even with my tremor. The teacher taught us how to best use our tools and how to work with a large format. I was having some problems with my pencils so my teacher helped me by introducing me to a heavier mechanical pencil. I soon wanted to do some work in color so I started researching colored pencils. I wanted them to be good light fast pencils, creamy and easy to handle. I joined the Colored Pencil Society of America, the state chapter CPSA DC 224, and the local Pallet of Roses. I also subscribe to two colored pencil magazines. I’m not satisfied doing the same thing all the time so I try different subjects, papers, and pencils just to “get out of my box” and not get in a rut of doing the same thing!